This set is highly sought after by Basketball Trading Card Enthusiasts. 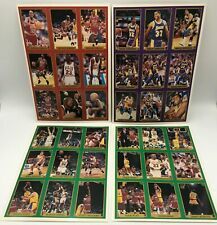 This set contains all 4 Uncut Basketball Card Sheets. Each of the 4 Sheets have 9 Basketball cards in this series for a total numbered set to 36 Cards. 1990-91 Skybox Press Proof Promo Sheet - MICHAEL JORDAN / LARRY BIRD Lot of 4. Condition is Very Good. Shipped with USPS First Class Package. An excellent condition (See pictures - near mint except for dinged corner at lower right of sheet and a VERY slight bend) 1992-93 Fleer NBA Basketball Promo Sheet of 9 cards. 1990 Hoops Team Night Sheets Michael Jordan PSA 7 NM. Condition is Brand New. Shipped with USPS First Class Package. This set is in 9 pocket sheets. This special set has foil like surfaces, and pictures thru his career. I pictured 6 in the last scan, the cards in the sets will vary from these 6, but be from similar sets and years. 1 SHEET MJR1. 1998 UPPERDECK. Condition is Very Good. The booklet itself is in good condition, but the uncut sheet of cards is in great condition. The uncut sheet features -Mike Bibby. -Derek Jeter. EACH CARD IS PERFORATED. 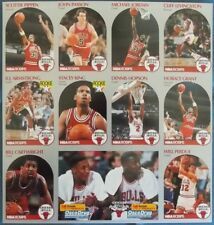 CARDS OF JORDAN,DREXLER,BARKLEYEWING, WORTHY, EATON. Winner to add $5.50 for delivery confirmed receipt shipping. Please see my OTHER AUCTIONS. Thanks and Good Luck !!!!!! ￼ Powered by eBay Turbo Lister The free listing tool. List your items fast and easy and manage your active items. Team: Chicago Bulls. Year: 1992-93. Michael Jordan Card + Others 1995 Sports Illustrated For Kids Full Sheet PSA ? Michael Jordan #101 On Uncut Sheet With Rookie Of the Year !!! It’sb eh in d museumg la ss a nd s ea le d. sh ee t is i n gr ea t sh ap e.. This is a great looking item. This thing is old. I have had it since I was a kid and loved MJ. I caught a couple of "bends" in the glare so u cld see them but u cant really see them unless u are looking for it. I Couldn't find anything else like it. The redemption card is unused and obviously has expired. You see the item clearly. MICHAEL JORDAN 1990-91 HOOPS TEAM NIGHT SHEETS PERFORATED PSA 10 GEM MINT! TEAM NIGHT SHEETS PERFORATED! VERY RARE!